Dishwashing drudgery is something we all must face every day. Whether we have a dishwasher or not, handwashing dishes is an unavoidable, unpleasant task of life. GNLD’s Lemon Drops will remove some of this drudgery by bringing space age technology to your kitchen sink. 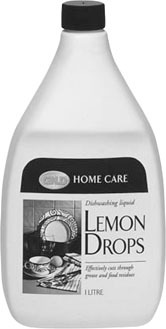 Developed in GNLD’s Home Care Laboratories, Lemon Drops is manufactured with scientifically-controlled standards to deliver top cleaning power and consistent quality. You and your customers will enjoy the excellent performance of GNLD’s Lemon Drops and see the results with sparkling glasses, shining silver, gleaming dishes, and superb cleaning results. The kind of results you’d expect from GNLD... because everyone has dishes to do... GNLD created Lemon Drops just for you. Mix Lemon Drops - 2 parts water to 1 part product in your mixing bottle. One or two squirts will do a whole sinkful of dishes. Spot-free sparkling glasses, shiny clear silver, gleaming dishes, superb cleanliness with a minimum of effort. Its concentrated formula makes it very economical to use. Dishes rinse free with no residue, deposits or soap scum. Makes even the most difficult cleaning job a pleasure and leaves a fresh lemony scent. Makes a tough job easy while being mild on fragile dishware and gentle to your hands.